“What are CPT Codes?” is the second installation in our series on decoding healthcare jargon. To visit our introduction to the series, click here: Healthcare Acronyms You Need to Know. So you’ve read through the healthcare acronyms you need to know and have a better idea of the bigger picture. Now, it’s time to dig a little deeper in a few of the acronyms we’ve described, starting with CPT Codes. Let’s jump right in! If you dabble in mental healthcare for even 15 minutes, you’ve likely encountered the term, “CPT code.” So what exactly is a CPT code, what’s it used for, and which CPT codes do you need to know? Question: What is a CPT Code? Current Procedural Terminology (CPT) is a code set by your practice to describe services rendered to clients/patients. If you’re billing an insurance company for your services, you must describe those services using a CPT code. All CPT codes are five characters long. Want a cheatsheet of the most commonly used CPT Codes? We’ve got you covered. Click below to download a FREE 1 page CPT Code Cheatsheet! The American Medical Association (AMA) developed the Current Procedural Terminology (CPT) over 50 years ago. The goal in mind: to create one, unifying language for healthcare. The CPT code set is actually a registered trademark of AMA. It’s used across the healthcare industry by clinicians, physicians, health insurance companies, and accreditation organizations to communicate diagnostic, medical, and surgical procedures and services. The AMA Board of Trustees is responsible for maintaining the code set. They’ve assembled a crack team dubbed the “CPT Editorial Panel”. In 1996, when the Health Insurance Portability and Accountability Act (HIPAA) was passed, CPT codes were designated as the new national standard for coding medical services and procedures. If you’re interested in learning more about the background and upkeep of CPT codes, click here for the AMA CPT Overview and Code Approval article. While submitting medical billing, you’ll use both a CPT code and a diagnosis code (ICD-9-CM or ICD-10 CM). 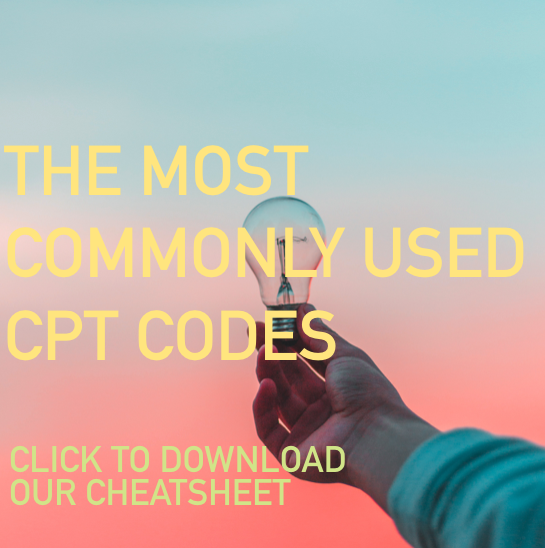 Click here to download a list of the most common CPT codes used in mental health settings.